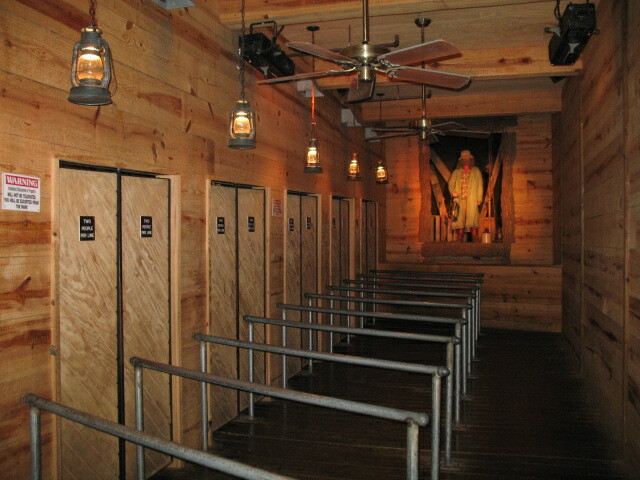 Traditionally Adventureland's rides were the epitome of a traditional park. Outlaw is one of CCI's older woodies, but also one of their better ones. Underground is considered a wood coaster, but it's more of a dark ride. 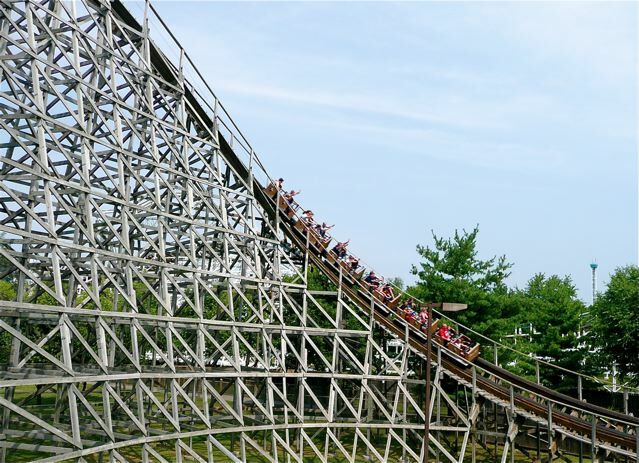 It's neither a great coaster nor a great dark but certainly worth riding for its uniqueness. 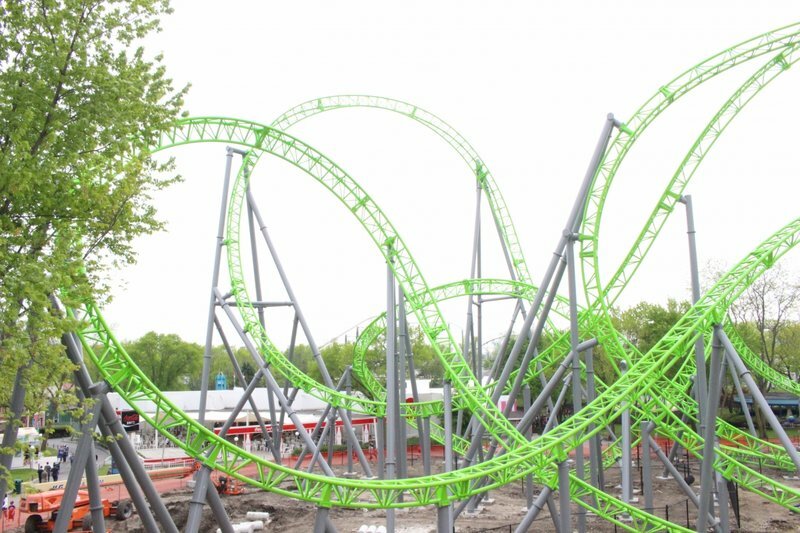 Dragon is a rare coaster from Hopkins. 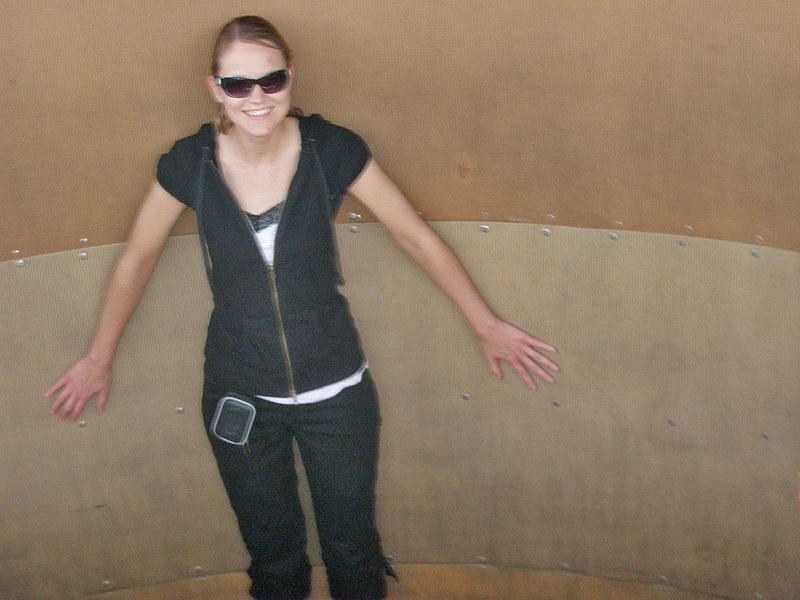 Then the park changed the game by adding Monster, from Gerstlauer. It is a very well received coaster. The park maintains their flat rides well and runs them for decent cycles. 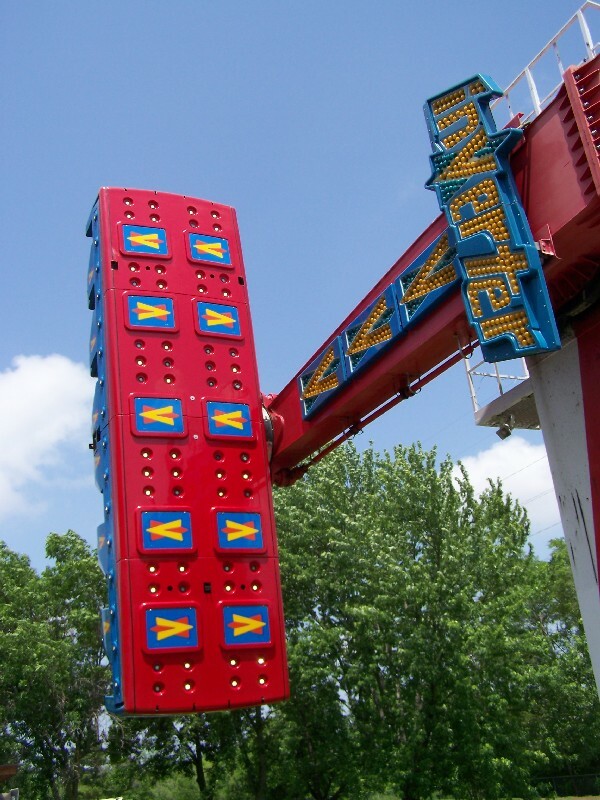 Some that should not be missed include Sidewinder (Frisbee), Der Flinger (Paratrooper), Silly Silo (Rotor), Falling Star, Space Shot (S&S Tower), and G-Force (Breakdance). 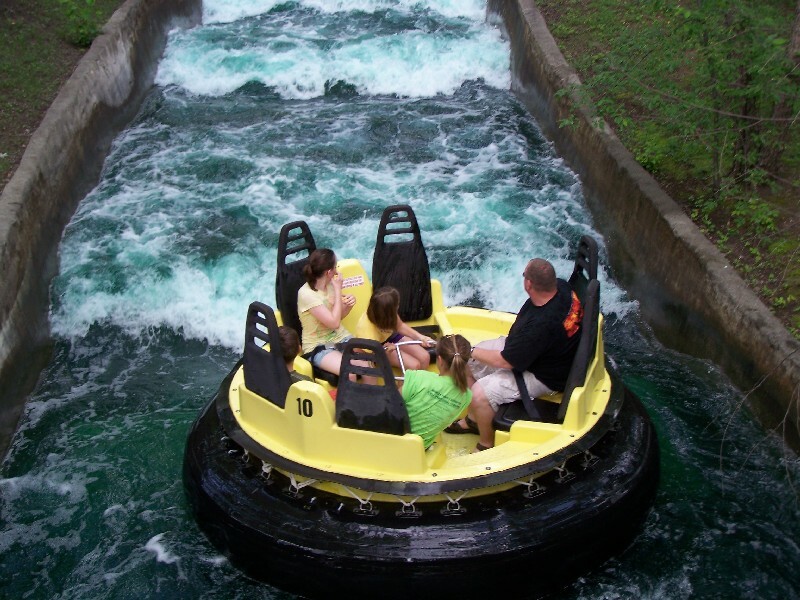 The park has two water rides in Raging River and River Rapids. Neither of them are guaranteed to get you wet, but lines are long in the summer, particularly for the rapids. 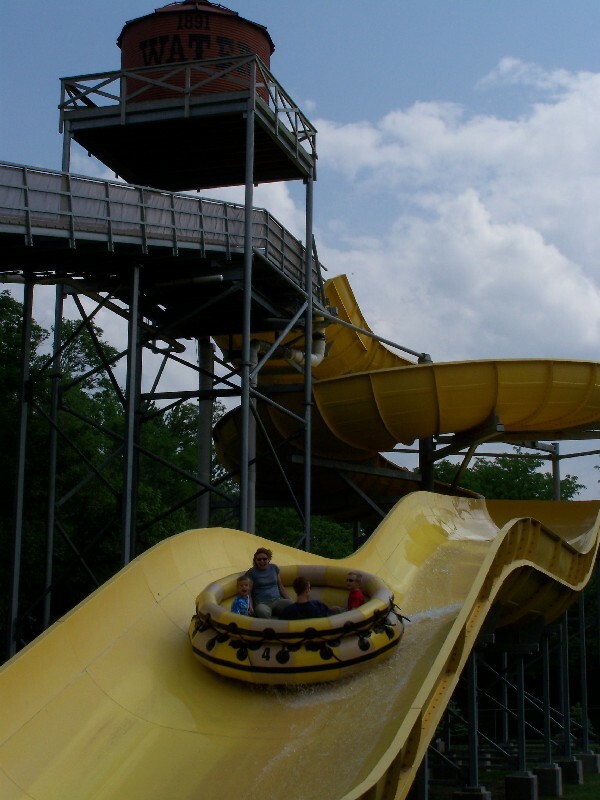 There's plenty of wetness to be had in the adjoining water park, which is included in your park admission. 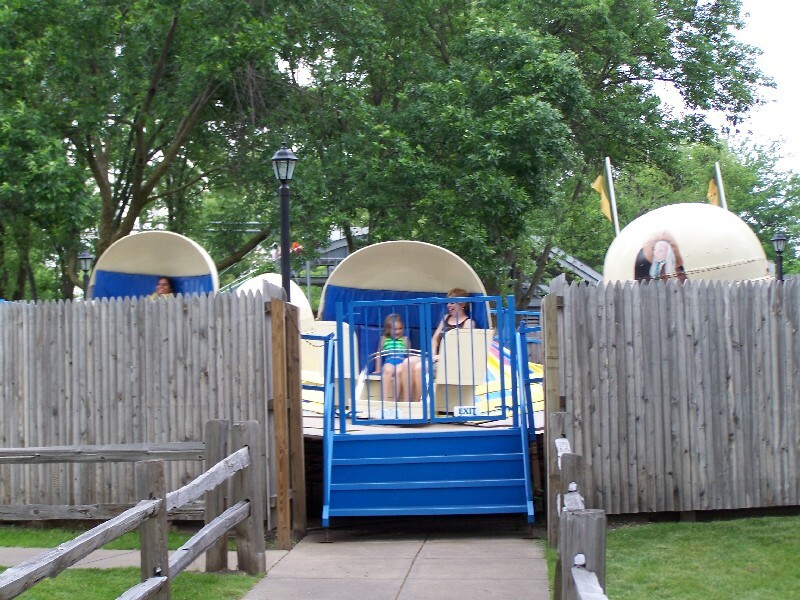 The park also still only charges 25 cents for SkeeBall. It's mostly standard amusement park food with BBQ, fried chicken, chicken tenders, hot dogs, hamburgers, pizza, sandwiches, and salads available at various locations in the park. Some of the unique offerings are tacos in a bag (fritos with taco meat) and footlong corn dogs. The park also has real, fresh-made lemonade and large slabs of bacon. Don't miss the traditional ice cream parlor on Main street. The season runs from early May to late September. 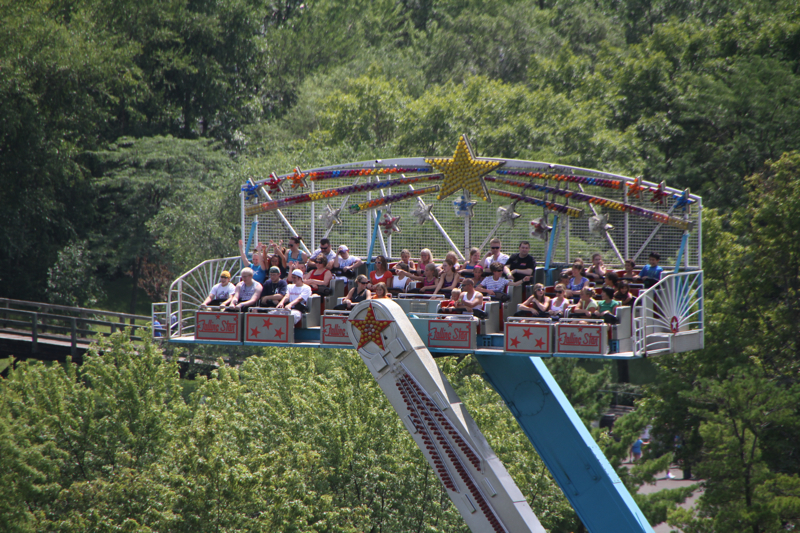 Daily operations occur from late May to late August with weekends only to open and end the season. The park is located a couple of miles northeast of Des Moines in Altoona. 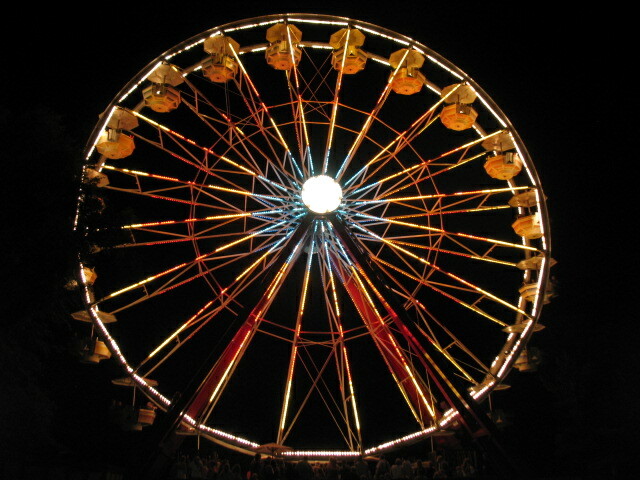 The park is within one mile of I-80, the major interstate crossing East-West through Iowa. 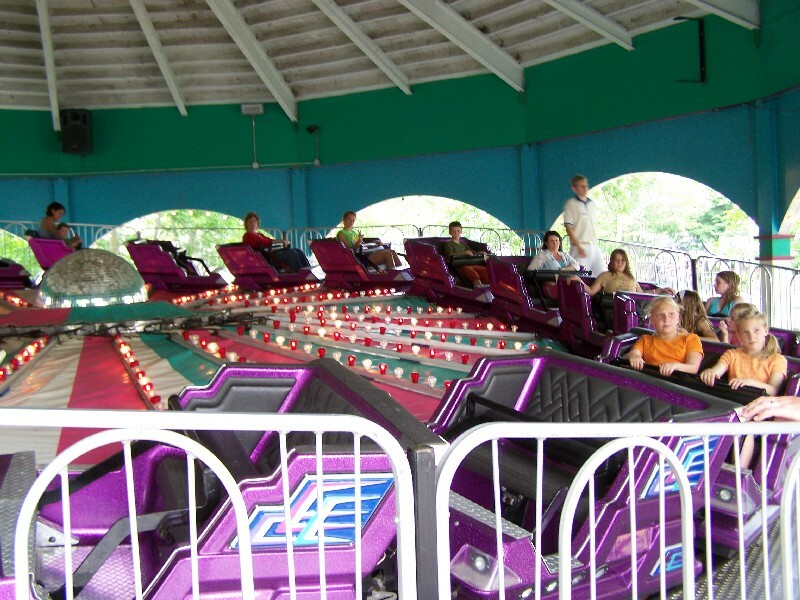 Adventureland has a Bingo Hall on Main Street that is very popular with the locals. 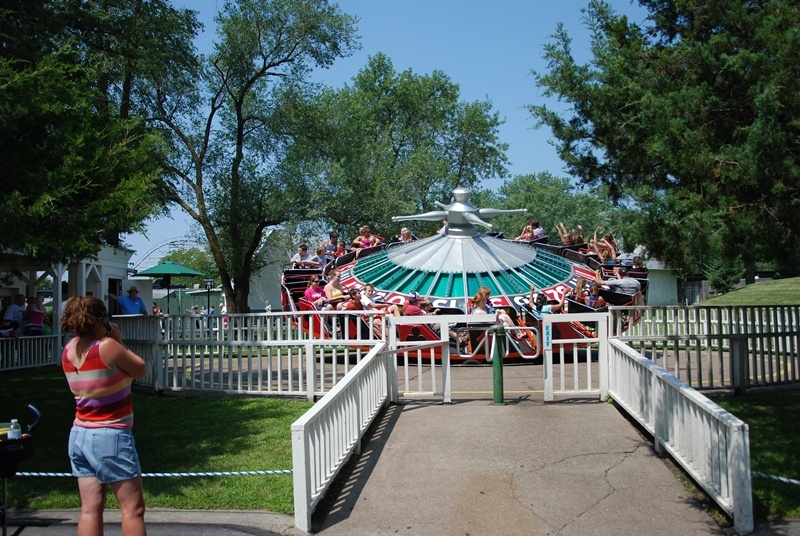 Adventureland is known for having some of the friendliest staff in the industry. 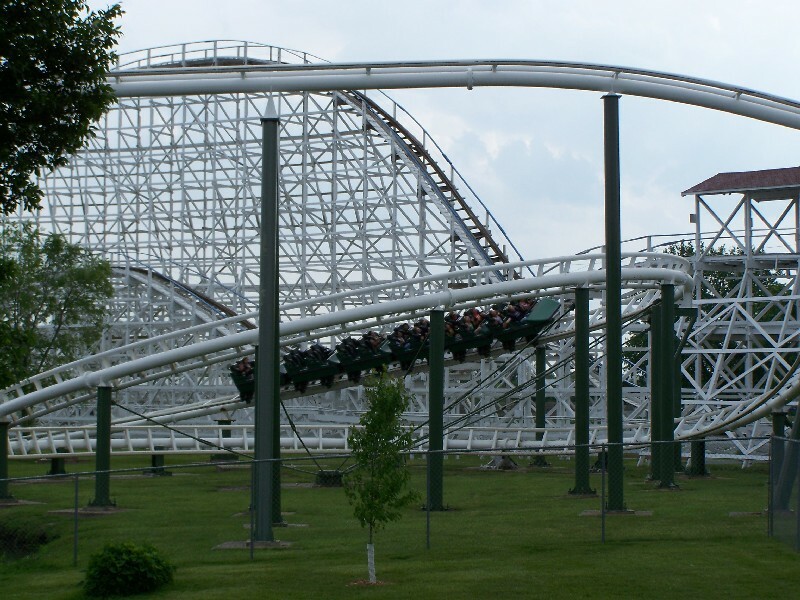 But the park also has a very solid lineup of flat rides to support three wooden coasters. 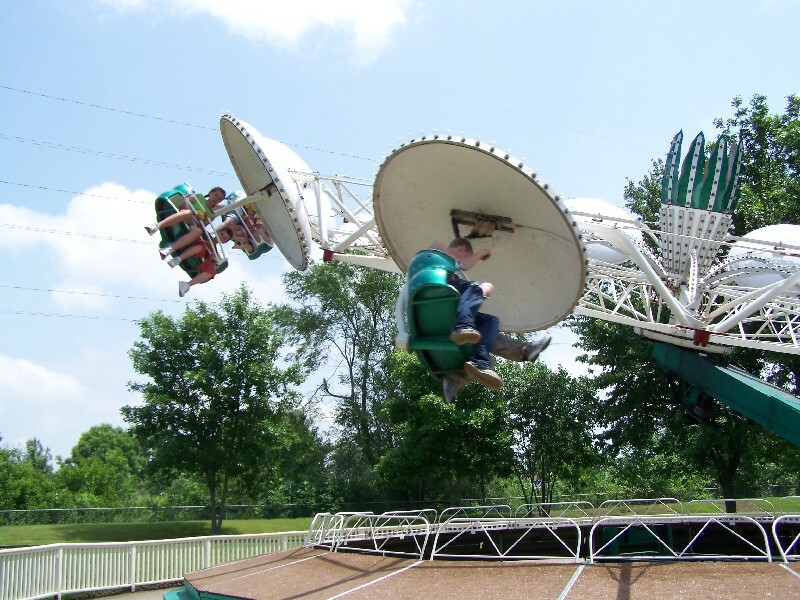 Many of the flat rides have low height restrictions for allowing a kid to ride when accompanied by an adult. 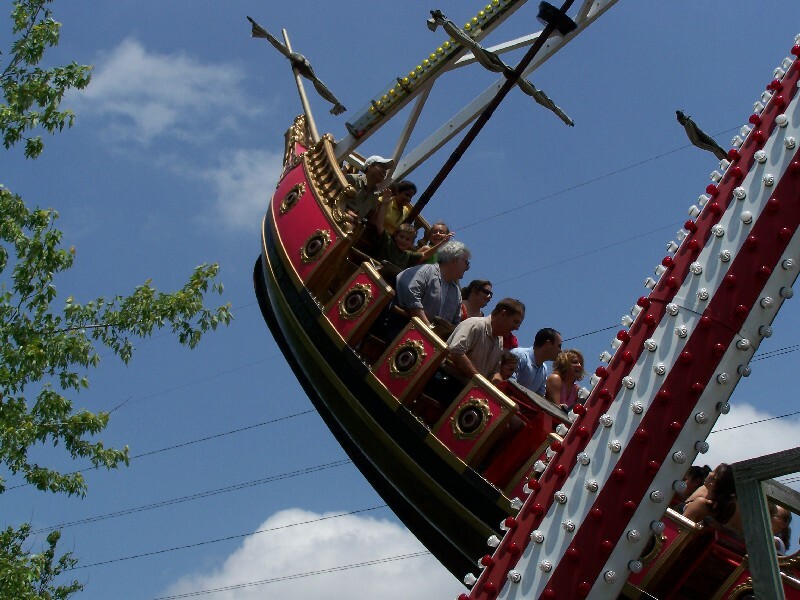 The water rides can get you very wet, so be prepared. 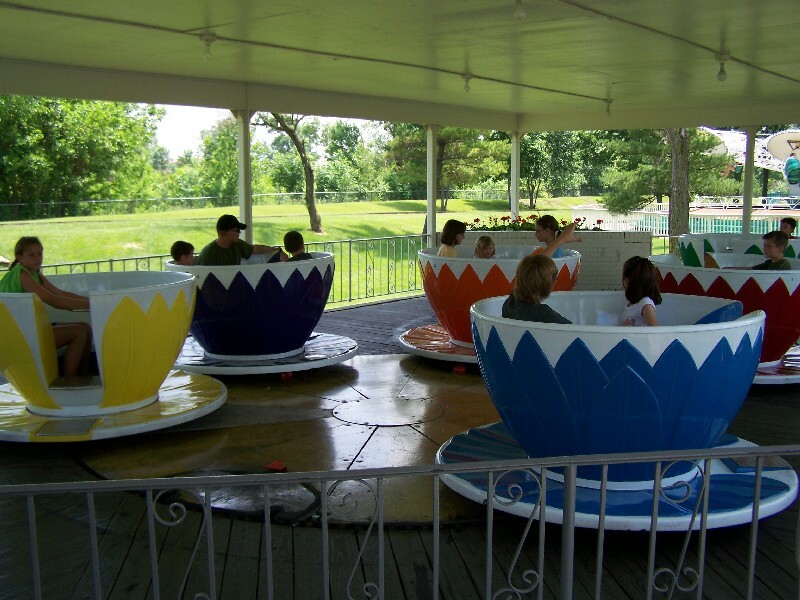 Typical theme park fare can be found throughout the park and is reasonably priced. Games of chance are also fairly priced, so the young ones won't destroy your wallet in that area. The park continues to improve, and I wanted to mention some of the food improvements... For 2017, three new chefs were brought in to supervise park food. While there are still corn dogs, hamburgers, you can now get Greek salads, baklava, and burrito bowls. 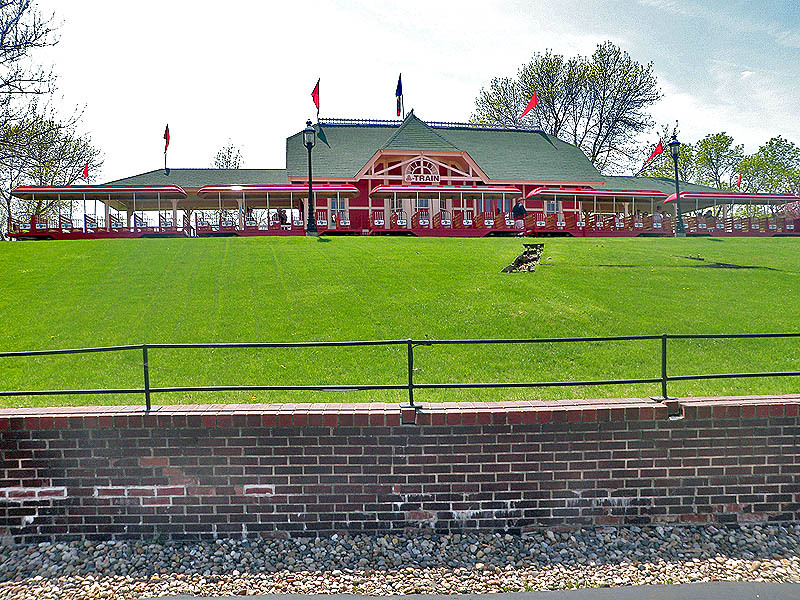 Much food is made in the park or at the Adventureland Inn's Spectators restaurant (including house made BBQ sauce). The Main Street Iowa Café still has some of the best mashed potatoes and fried chicken around, and now the baked beans have been fancied up (Dr. Pepper BBQ Baked Beans). It's quite the food experience! Adult beverages have been expanded again. Spiked ICEEs (six types of liquor), and a phenomenal German beir garten w/live entertainment. It's a great food year! 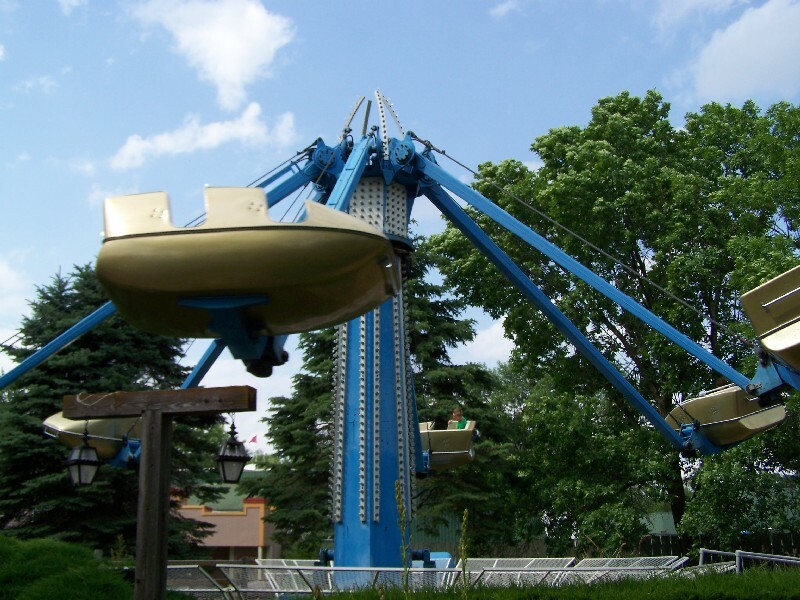 Adventureland is my favorite park I've been to due to all the old school flat rides and the shape they're kept in and also because of Tornado. That ride threw me up, down, and all around. It's now my favorite roller coaster of all the about forty I've been on. Outlaw is really awesome too, I certainly felt out of control! Dragon sucked worst than I ever could've thought. All the staff are REALLY nice. And compliments to the mechanical team, Falling Star wasn't expected to open, it did. Stormchaser (amazing, scenic ride, good replacement over Silly Silo) wasn't supposed to open until twelve, it opened at ten with the park. I will want to visit again soon. Adventureland is a gigantic hug! The park staff is very friendly and very good at their job. The coaster collection is okay. The two woodies are my favorite. Tornado being surprisingly fun as well as Outlaw. Underground is like a lighter themed Fire in the Hole, but I still love it. 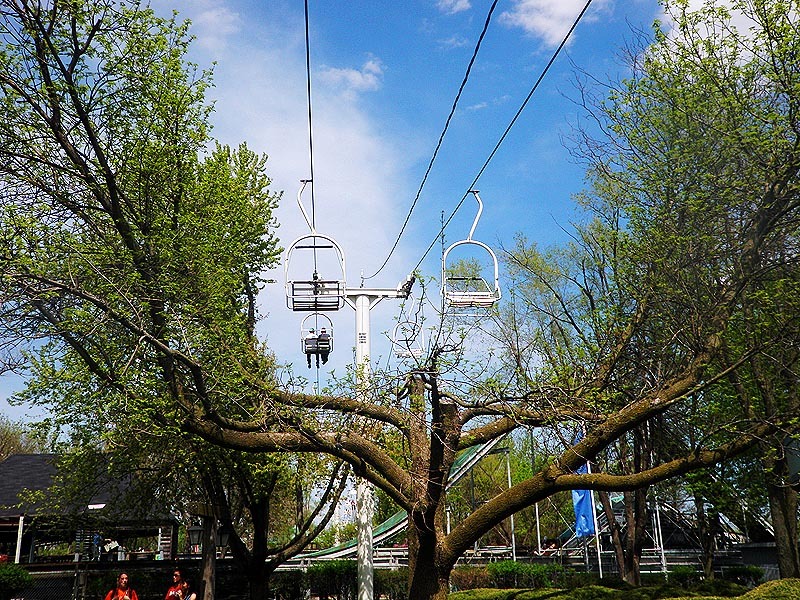 Their sky ride is my favorite sky ride I've ever been on. 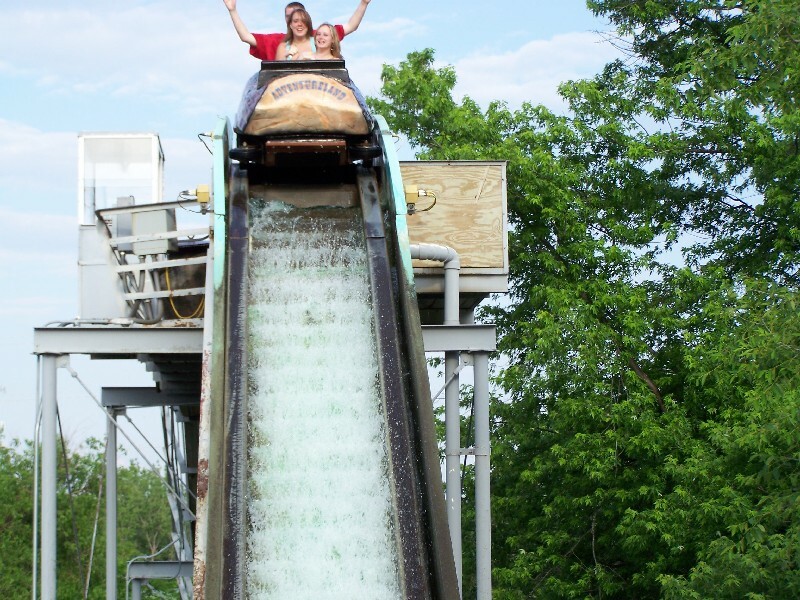 It goes right through the trees and over the log flume. You can actually kick leaves. Their new waterpark is very good as well, and has a great selection of slides. Racers, a solid four person Proslide, and a Proslide complex. Their swim up bars is one of my favorites as they have tasty drinks named after their coasters. It's a must stop destination if you are in the area! This little park is one of my favorite parks of all time! Most of the staff is very friendly and it has a very "Old school" feel to it. They have a great CCI woody (Outlaw), a water park with LOTS of awesome ProSlide, and one of the best looking main streets Outside of the Disney parks!! They lots of flats and although they lack in the coaster department, its still an awesome park and you should really pay it a visit! 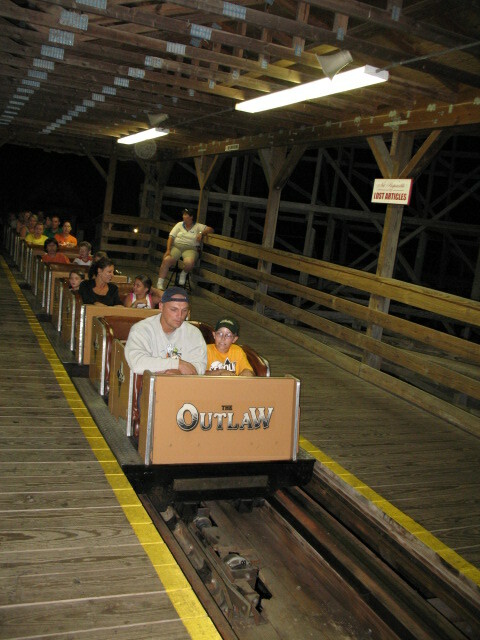 Two things stand out at Adventureland: the Outlaw, which is a very good wooden coaster, and the excellent, welcoming attitude of the people who work there. This is a very enjoyable park with a good collection of rides and a friendly vibe. The only real drawback (other than Dragon--a painful experience) is its relative isolation. 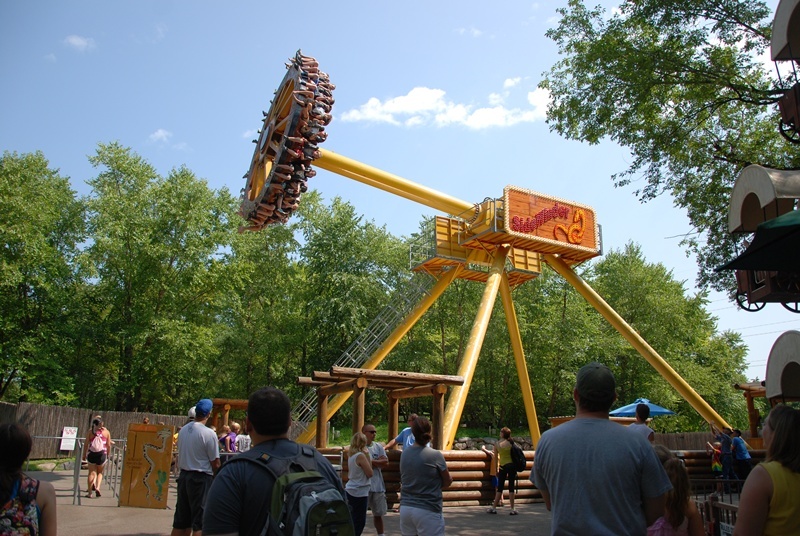 But if you're tooling around the Midwest, Adventureland should be on your agenda. I love this place! 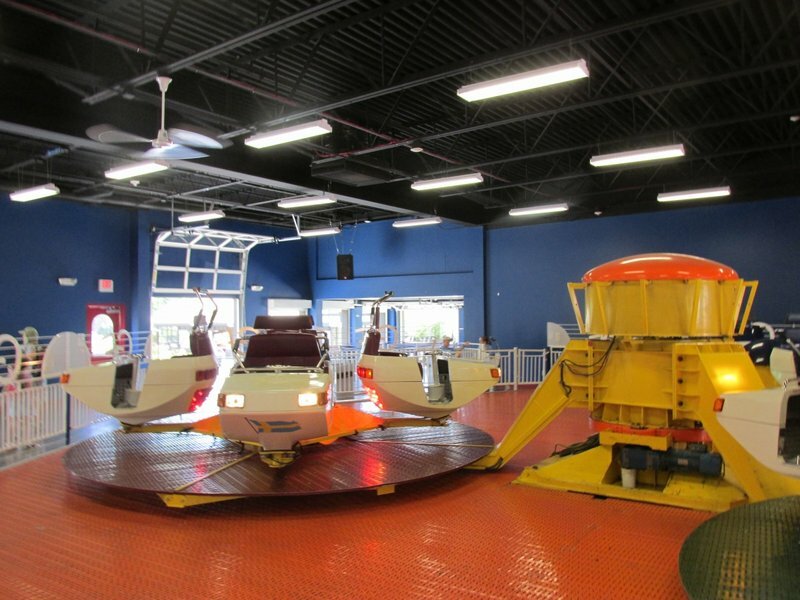 They have a line-up of three fun coasters. They're perfect for me, because I'm not a fan of the ginormous monsters a lot of theme parks have. And the staff is so friendly! I once heard that they visit retirement communities to recruit new staff members. Not sure if that's true, but there are a lot of nice old people working there. Plus, they have a bunch of flats. This is just a great park to hang out with family and friends, or spend the weekend at. The Dragon hurts, though! 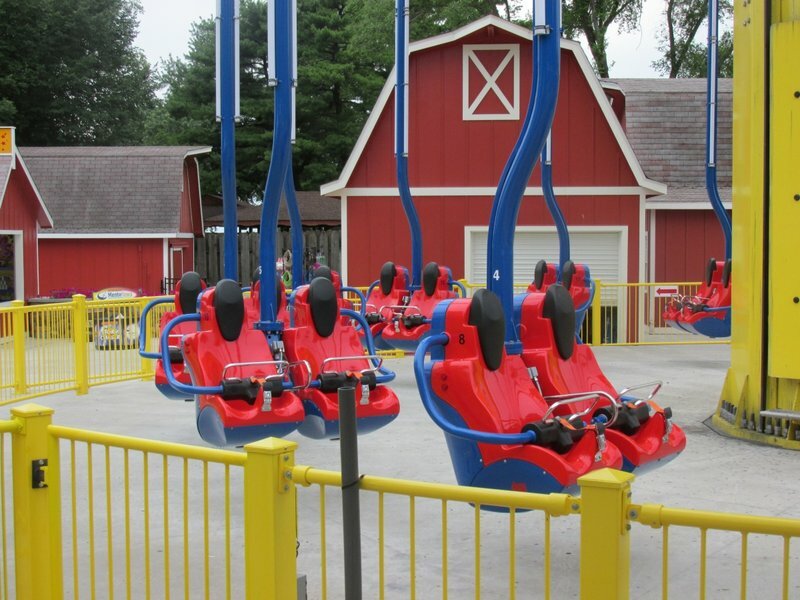 It's a good park, lots of fun flat rides and a few big coasters. There's friendly workers and some good food choices. There are a lot of fun rides, and some great flats. They also have a lot of fun foods that are not too common at other parks like Wintergreen Mint CrunchiCreme, and Pork Tenderloin sandwiches. Feeding the catfish is a cool thing as well. 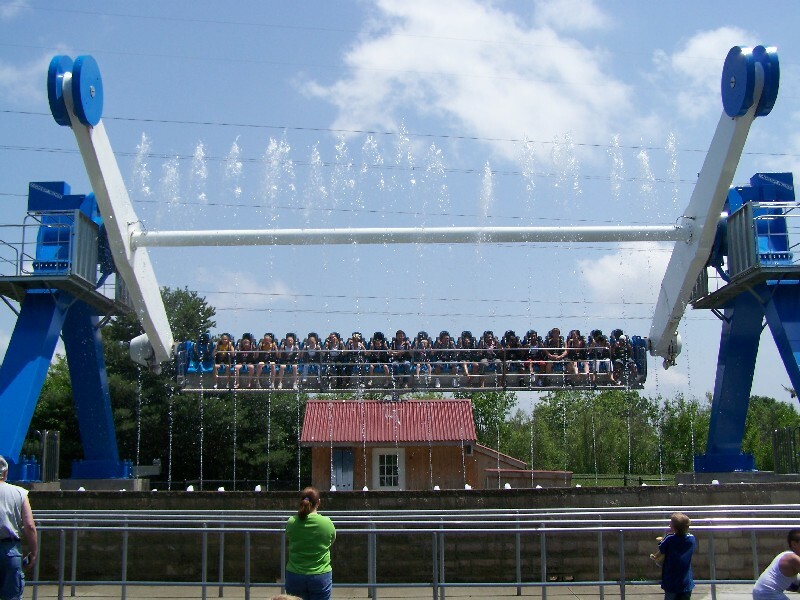 The Roller Coasters here range from bizarre and painful to alot of fun, but the park itself is awesome! The Flats here run INSANE cycles and the staff is great! Large variety of flats. Friendly staff. Reasonable prices. Included water park. 25 cent skeeball.